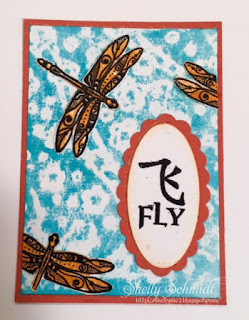 I had a moment to create this week, and took the opportunity o make a swap for the AOSA (About Oriental Art) Yahoo group- theme- dragonflies. This is a type of crayon resist. The SCS had a Try a New Technique challenge on Monday. I have done a variation of this technique, but this one was much easier..... I took white cardstock, placed it on an embossing folder with the impression part of the folder up. I ran a crayon over that and then rubbed/brayered on color. You get a better impression on the card vs the ATC of what the embossing folder design is. The dragonflu is by Michael Strong, the sentiment MFP. 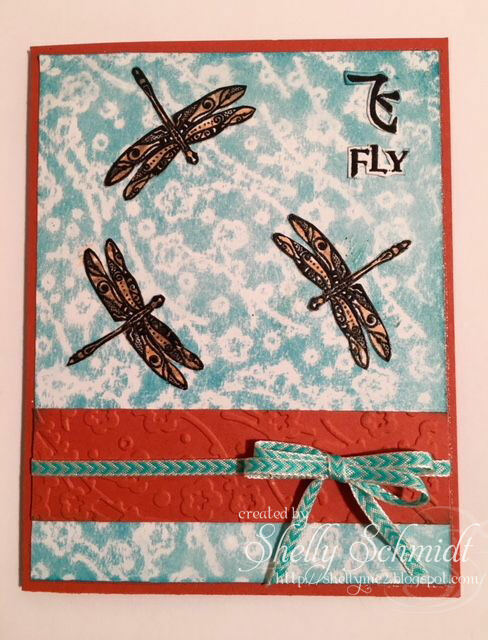 Love what you have created with these wonderful dragonflies, Shelly! Beautiful cards!! I may have to give crayon resist another try (if I can find some crayons around here)! May God bless your Thanksgiving with love and laughter! Very pretty Shelly. What a neat technique. I've never tried this. Great colors too. Wishing you a very Happy Thanksgiving. When I count my blessings I count you! I know I owe you an email yet. I'll answer next week after all the chaos calms down. Have a wonderful Thanksgiving weekend! Gorgeous cards Shelly. I love dragonflies. You rocked these cards out. 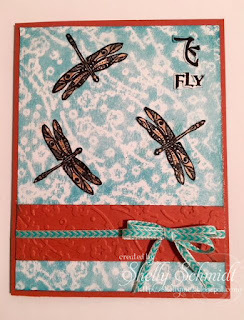 Shelly, your dragonfly cards are gorgeous! Shelly this is just gorgeous. Great technique. Hope that you had a wonderful Thanksgiving. I went to visit my son and had to go through Chicago on Tuesday...thought of you.